=) -_- T_T =P ;) Oh, the emoticon. Depending on who you're talking to (or I guess texting to? messaging to?) at the moment, emoticons can be as common as some words. When did they first start showing up? Did people write letters with smileys and frowny faces? Were typewriters used to express emotion through symbols? Maybe. 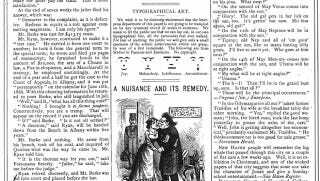 Apparently, the first emoticons were used in 1881.